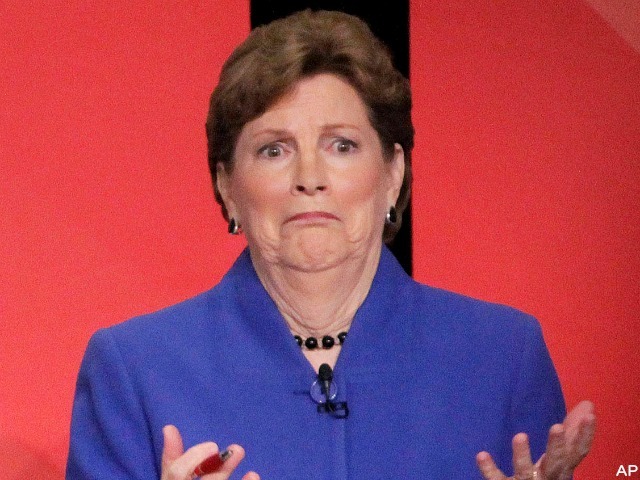 CONCORD, New Hampshire –To kick off the debate here Thursday evening between former Sen. Scott Brown and incumbent Democratic Sen. Jeanne Shaheen (D-NH), the Republican National Committee (RNC) hammered Shaheen for kicking this reporter out of a campaign event Wednesday. “Her campaign avoiding a reporter is just another reason for New Hampshire voters to reject Shaheen at the ballot box this November,” Williams said. Shaheen’s campaign staff kicked this reporter out of an open press event that was advertised as such on Wednesday, a day after Shaheen underperformed in a Tuesday night debate–with one of her answers eliciting widespread laughter from the audience. Shaheen’s campaign staff and the business owner, who runs green energy company ReVision Energy, have not provided any reason as to why they kicked a congressionally credentialed Capitol Hill journalist out from an open press event. Shaheen’s campaign’s actions have been highlighted by Breitbart News and several other media outlets, including left-of-center sites Huffington Post and Talking Points Memo. When Shaheen spokesman Harrell Kirstein was asked about the incident by the Daily Signal, he at first denied knowledge of it–and asked for a description of what happened. He did not respond to a request for comment once what happened was described to him. Thursday night’s debate will be hosted by CNN’s Wolf Blitzer and NH1’s Paul Steinhauser.